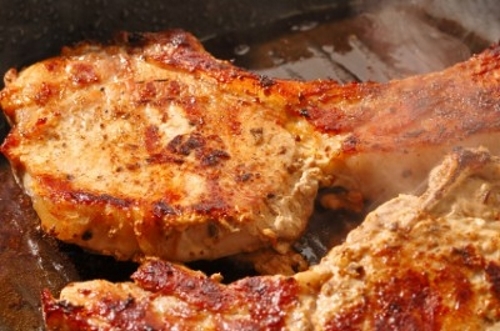 The first time I had these Italian style raised Pork Chops at my Uncle's house, I knew had to have the recipe for my family. I love it when he pulls out the gallon of homemade wine. It just makes the meal so much more Italian. Braised pork chop is a simple dish that can be served on a nice bed of fried polenta or on top of creamy risotto. If you have the homemade wine please use it. If not, a great bottle of Barolo or Amarone will work perfectly. Savor this one. You'll be frequently including it in your family gatherings. Fry chops on both sides in oil until browned. Add onions, sweet peppers and mushrooms for about 10 minutes. Add diced undrained tomatoes and oregano and cover and let simmer for about an hour until nice and tender. While the chops are cooking prepare polenta. Bring water to a boil and add polenta slowly. Cook polenta while whisking constantly for about 10 minutes. Remove from heat and add butter, salt and pepper. Pour polenta in a greased baking dish and refrigerate until cool. Cut polenta into 3 inch squares. Fry polenta in olive oil on both sides until golden brown. Place two squares on a dish and sprinkle with cheese. Add chops and tomato mixture and eat the whole thing.